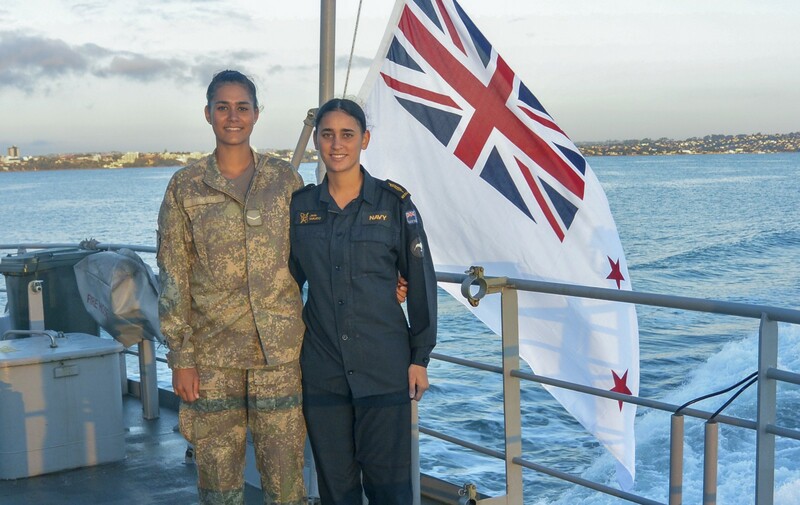 Sisters Lance Corporal Tamika Taikato and Communications Warfare Specialist Jade Taikato deployed together on HMNZS Wellington for the New Zealand Defence Force’s resupply mission to the Kermadec Islands. Two sisters from the New Zealand Army and the Royal New Zealand Navy (RNZN) shared a trip to sea last month on HMNZS Wellington for the New Zealand Defence Force’s (NZDF) resupply mission to the Kermadec Islands. Lance Corporal Tamika Taikato, 23, is a Movement Operator with the Army’s Logistics Regiment based at Linton and has been to sea several times with the RNZN. Her younger sister, Able Communications Warfare Specialist Jade Taikato, 21, went to sea for the first time since joining the RNZN in 2017. The sisters, the two oldest of eight children, who both went to Whangamata Area School, deployed together on the RNZN’s twice-yearly trip to Raoul Island, the largest of the Kermadec Islands, to support the Department of Conservation base there and research work by scientists. “I was excited to be on board with Jade,” Lance Corporal Taikato said. “It was cool to have a familiar face on board and have someone to ask about the Navy and get her insight. It was stories of life in the RNZN from the sisters’ cousin, Petty Officer Combat System Specialist Andre Taikato, who served 17 years in the RNZ Navy and is now a Reservist, that inspired them to join the NZDF. “I liked Andre’s stories, but I get seasick so preferred to serve on land,” Lance Corporal Taikato said. Her sister, Able Communications Warfare Specialist Taikato was also inspired by her cousin’s time in the RNZN and visited Devonport Naval Base when he was based there. “I wanted to travel and play sport and I could do both of those in the Navy, as well as study. It’s a good lifestyle in the Navy,” she said.